These Origami Ornaments are beautiful one-of-a-kind works of art. Each origami ornament is hand-crafted with care by a local artisan in Mill Valley, California. Traditional Japanese Origami foldings using the finest Japanese paper are made into beautiful "Peace Cranes", "Holiday Trees", even "Reindeer" and they float in round blown glass ornaments. Each is an original work of art and color. The "Peace Crane" Origami's are a symbol of spreading peace throughout the world. 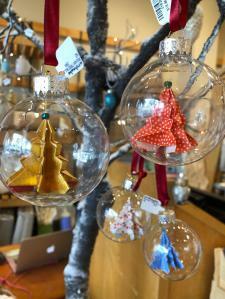 The "Holiday Tree" and "Reindeer" origami ornaments are new, seasonal, and in very limited quantities. These hand made Origami Ornaments are an Earthsake best seller for the holidays! After picking up a few for yourself - be sure to buy a few more to give these out as unique gifts of art! This is a perfect gift for art collectors, origami lovers, ornament afficianados or anyone who just enjoys beautiful hanging ornaments with a great story. A great gift that shows thoughtful care in finding something original, unique and something they surely wont get anywhere else.